Any sound engineer or drummer knows that getting a great bass drum sound in a studio can be a crapshoot, and may be an even bigger headache in live situations. Do you take off the front head, stick a pillow inside, then lay the microphone on the pillow, leaving the front head off so a roadie can crawl onstage during the show and reposition the mic after it, inevitably, moves? Do you leave the front head on, throw the mic inside and run the cord out a hole cut in the front head? Do you place the mic on a boom stand and stick its business end through the hole in the front drum head, usually sacrificing capturing the "slap" from the beater? Do you nail down the boom so that it doesn't fall over when the bass drum creeps forward? Do you put one mic on the rear head and one inside the drum? No wonder sound engineers go prematurely gray. Now the Kelly SHU bass drum microphone mounting system solves these multiple problems with unique, simple design that allows engineers to achieve consistent microphone placement from gig to gig with a minimum of time and effort. 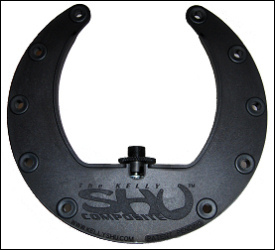 Invented by Jeffery Kelly, the SHU is a one-stop-shopping solution for almost every bass drum micing need. For our test, we installed the SHU composite system inside a 22" Yamaha Custom Birch bass drum used in a worship band setting. We chose internal installation for a few reasons. First, our sound engineer thought that internal placement provided the best combination of sound by capturing both the slap of the beater on the rear head and the boom of the drum itself. Second, the stage set is frequently broken down to accommodate other uses, and leaving the microphone inside the drum made for fewer moving-day headaches. Finally, we previously had used a boom stand to point the kick drum microphone through the front head port, a less than ideal situation because although it was nailed in place, the kick drum often crept forward, either knocking the boom out of place or -- at worst -- hitting the stand and causing unwanted clanking. Plus, the drums are set up behind a Plexiglas sound shield that had to be disassembled to reach and reposition the kick drum mic once it moved. Internal installation solved all these problems and couldn't have been simpler. For internal installation, the Kelly SHU is designed to be mounted either horizontally or vertically for optimal placement. If you use an internal baffling system, the SHU's elastic mounting cords can be adjusted to keep the microphone away from the baffling or to hold it in place against the rear head. The first step in mounting is to attached the supplied leather mounting patches inside the drum by removing a single screw from one of the the drum's tension lugs, folding the leather into a loop and then passing the screw through the two holes in the loops end and tightening it back into the drum. This process is repeated until you have as many mounting points as you desire. The elastic support cords must be cut to length by the installer and their ends passed through the plastic anchor hooks. Once the cords are cut, you may have to adjust them to ensure that the SHU is suspended in the correct position and not hanging too loosely. It's a relatively simple and intuitive process, and Kelly supplies basic mounting illustrations with each SHU. A step-by-step pictorial mounting guide is also available on the Kelly website: www.kellyshu.com. External installation is somewhat simpler in that the leather loops do not have to be installed. Rather, the elastic cords are anchored by hooks to the from head's tension lugs, allowing the SHU to be suspended over the sound port. Again, Kelly supplied step-by-step instructions. Our installation took less than 30 minutes. The only slight problem we encountered was that the screws for the Yamaha lug hardware were almost too short to engage the threads after the leather loops were in place. But some elbow grease solved that glitch pretty easily NOTE: Kelly is a ware of this and is working with a supplier to produce thinner leather loops. . The Kelly SHU bass drum microphone mounting system is a simple, effective and reasonably priced alternative to the migraine headache of achieving consistent kick drum mic placement in a variety of situations. Our sound engineer was very pleased with the SHU's ease of installation and its ability to place our chosen mic in precisely the right position to deliver a tight, punchy, deep bass drum sound -- "the ideal mix of slap and boom," as he put it. The Kelly SHU is available direct from Kelly Concepts and at retailers. The SHU Pro (Aluminum) has an MSRP price of $129.95 USD and an average street price of $99.95. The SHU Composite carries an MSRP of $62 USD and an average street price of $51.95.